my 11 year old, Olivia and I read The Golden Compass. Below you will find her review as well as some notes from mom! We can't wait for this coming release and new spin-off series! 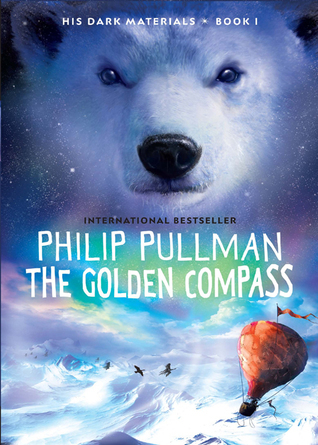 The Golden Compass is a book that takes place in Philip Pullman's own version of the real world. In this world humans live together with daemons, every human has their own daemon and they can never go far from each other. Daemons take on the forms of animals, like cats and dogs, only children's daemons can shift between forms. One day a girl at Jordan College, named Lyra, goes on an incredible journey all because of a series of unfortunate events (hahahahaha). She and her daemon, Pantalaiomon, end up meeting all sorts of people, also some armored bears. The writing in The Golden Compass is great and in my opinion it is a similar style to Watership Down. [Mom Note: This is a huge compliment because Watership Down is Olivia's favorite book, period] The characters are very interesting and for some of the evil ones I felt almost as angry as Lyra herself. Since it is the first book in the series, the outcome is a bit of a cliffhanger, it made me really eager to read the next book! I truly adored this book. As Olivia mentioned the world building is the real world yet not. In the beginning I struggled a little to grasp that while everything seemed familiar to me, this is not the world that I am used to. The world building gave me vibes of a parallel universe and once you let that settle in your soul it is so easy to get lost in this world of mystery and magic. I know as I read the book after Olivia I kept asking her, but why is this happening, where did they go, etc and she just kept telling me 'Mom, read the book. I can't tell you with out going you spoilers!' and it was so true. You have to trust that this book is going to take you where you need to go, it is going to wind you down a path with several surprises but ultimately and satisfyingly get you to the 'end' (as much of an end as the first book in a trilogy can be) and answer the majority of your questions. I loved that I wanted more all the time, I wanted to flip to the middle of the book, then I wanted to flip to the end...but I am telling you now do not do that. Ride this book out page by page and let yourself go in it's beauty. Now with all that said I know that this book is not for everyone. This is a book that will challenge your thoughts on adults and children. It will challenge your ideas on how you see the world, on your thoughts about large government or religion having power over the masses. It will make you think about the purity of children and their inherent goodness and how the choices they make and the choices the adults around them make will shape them. These aren't things that most young children are going to pick up on. As you saw in Olivia's review, her thoughts while reading the book leaned more to the magical aspects of the daemons, the action, and of course the bears. I loved train theme (to me) in the story, the growth in Lyra as she begins to discover just who she is and who the people around her are. Do I always like the choices she makes, certainly not but I am coming at this from an adult with children stand point and while I would like them to be brave and to find their own path, I wouldn't like how Lyra spends a good portion of her time lying to discover what she wants to know. Does it get us to the end and is she better than what we see at times, yes, but as an adult mom it made me cringe now and again. These same things aren't aspects that a young reader will really pick up on. What they will see is her desire to find answers, her bravery, her protection of her friend, her understanding that people are people no matter their wealth, ability, etc and of course the bears...because seriously the bears are freaking awesome. The Golden Compass will turn some readers away. Philip Pullman is unabashed in his agnostic beliefs and that comes through in this book. Again, this isn't something that most children will pick up on with out the guidance of an adult in their ear but it is certainly a heavy part of the book and you should be aware of that before going in. Think of the Golden Compass as the antithesis of The Chronicles of Narnia. The Golden Compass is a beautifully written story full of adventure and daring and a truly wonderful read.